If you read Blink, you might remember the guy who could tell within an instant of a server's motion if they were going to fault. Well, I've known in much the same Lizard Brain kind of way that I was going to frog the first Charade sock because it was just a little tiny bit too small since about the second round of pattern. That didn't stop me from knitting on it, not until about 3" into the pattern, because why should I frog it? It's going so fast! See, I just did a repeat! And there it went again! Oh, I would try it on here and there and think hmm, it could be a bit looser, and hmm, 64 sts on 1s is a little smaller than I tend to like. And then go back to knitting on it. Honestly, I'm not even sad about the frogging, just relieved. Now, half an inch back into the cuff, I'm thinking: will 68 be enough? But now I'm just being ridiculous. 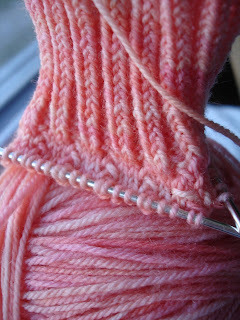 I have cast on a pair of Charade socks (PDF) in Dream in Color Smooshy, colorway Giant Peach. And if you are a sock knitter, and you haven't gotten any Smooshy, or if you have and it's been hanging out in your stash because you've been working on other stuff, well, I say to you: Now is the Time for Smooshy. Yesterday at my second job (call it a hobby job, a yarn money job, a job I still have because I kind of never quit it) I spent many hours becoming increasingly enamored with the idea that this Giant Peach would look freaking awesome in the Charade pattern. So after an hour of enthusiastic, then rather impatient ball-winding -- why does that always take longer than I expect it to? -- I finally cast on. And the Smooshy has an almost preternatural softness to it, but it's also got very nice body and I'm concentrating a lot on not knitting it as tightly as I'm tempted to. which is destined to become a single-rib striped scarf for Other. Patterned after a very hip one that Keith Richards sports in a video of some kind from the '70s. I swatched on 6s and a) don't like the fabric, and b) don't like the idea of spending the next 600 knitting hours of my life on it, so will try again with the yarn doubled and bigger needles. 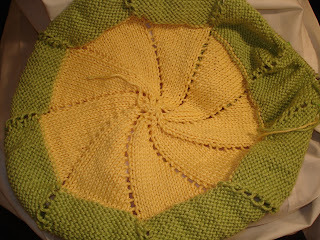 is a rather terrible low-light picture of what promises to be a nice baby blanket. Pinwheel pattern, in Knit Picks Shine Sport. Shine is 60% cotton and 40% modal, and it is slick and soft. Very nice. If not for the Stash Knit Down group I'm in on Ravelry, I would have purchased a bunch more of it to stash for inevitable future baby blankets. For now, round and round I go with what I've got. I just retrieved a very soggy box of yarn from the front step. The box was soggy, the yarn was not, the pattern was damp. What I got was a skein of Risata with which to finish up Other's socks, some more self-striping sockyarn, and enough Shamrock in Fitzpatrick to make my Dad some convertible mittens for his early February birthday. He's about the only family member who didn't get a handknit for Christmas, so even though I suspect he doesn't have a great need for convertible mittens, they're the best thing I can think to make him. I love love love it. It is loud and happy and rather completely over the top. Man if I'd known it would take 3 minutes, I might've offered up some actual knitting pictures. Unfortunately, the sun got home before I got home, so my finished hat and finished kind-of-boring raven socks will still have to wait until tomorrow. For now, I am here to tell you that from now on, I will be posting at http://www.dittenknitten.blogspot.com. That is, if I can get this blogger stuff worked out. Hahaha. I wandered away from the thrummed mittens for a bit, in order to participate in some knitting... not fiascos, not adventures, not abominations. What, then? Well, situations. Situation 1: Crusoe socks: in which I learn that tennis ball green + reddish purple are not really my colors. This is some long-stashed Sunshine Yarns Soft Sock in Dragonfly. For Crusoe, I scoffed openly (scoff scoff scoff) at the idea that a 48-stitch cast on would be in any way relevant to my foot. I picked up some 2.25mms and cast on 72. And that worked out well, because this yarn is thin. So thin that while I was still working on the gussets, I decided rather grumpily that with a thicker yarn I'd be to the toe by now. But I am forging ahead, and generally like how these are coming along. Situation 2: That Stocking Cap I Mentioned Before: I run out of yarn and follow the pattern directions way past the time that I decide that the pattern directions are not giving me what I want in terms of this particular Stocking Cap. Actually, my capsule summary pretty much says it all. 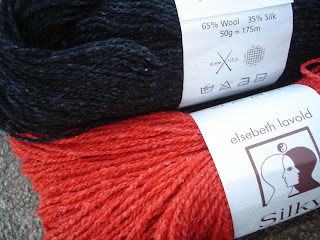 I bought more yarn -- the store had a big old pile of it, even though I'd gotten it months ago. Months ago on sale at half off, actually, so I got the honor of paying over $20 for a skein, which did not feel so great, but I do like the yarn more than I thought I would. Knit up it got a bit quieter than it seemed in the hank, and the second skein (of exactly the same dyelot) is somehow softer than the first. As for the problem with the directions not giving me what I wanted: I frogged and re-knit. I finished the knitting a bit ago, so now it is time for me to get my tassel on. The tassel is, in my opinion, the best part. Situation 3: Felici Arugula Stockinette Socks, most of which I knit in the total dark and which, being 72 sts on size 0s actually are probably a bit too small but hell if I'm going to rip an entire cuff knit in the dark. Situation 4: Fingerless Thrummed Mitts, which, it being above 50F so consistently these days, I haven't even given a thought to. Well, no, actually, I'm about to the thumb of mitt #2. Making thrums has gotten a bit old. 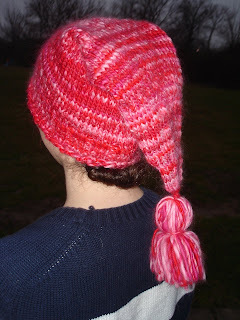 But, these are a nice antidote to Crusoe, because a few rows of knitting actually do make a difference in how it looks. I need near-constant positive reinforcement, apparently. Thrummed Mitts Progress Report; or, How Many Pins Did They Use to Set Your Arm? The temperature today was 7. Degrees Fahrenheit. I could REALLY have used some thrummed fingerless mitts when taking the dogs out and scraping off my car this morning, but have only finished one, and haven't even woven in the ends on that yet, and even I was not ready to take that fashion plunge. I started off, as Ravelry would give the impression most people do, making the thrums too large. Not really understanding the instructions for how to place a thrum that came with the kit, I relied on the Yarn Harlot's excellent FAQ (linked in the last post). She says you should knit through the back loop of the thrum and the stitch it was placed with on the next round, so I did. Unfortunately, as I am finding with the one-row scarf (which I just realized is hers as well - what is it with the YH and those ktbl-s? ), when I ktbl, the left side of the resulting stitch sits there all bloated and bulky, while the right side fades away. With enough yanking, I can kind of even them out, but it is not pretty. To get back to the too-large thrums thing, I eased off of them a bit once I ran out of the ones I had industriously made before starting. I wasn't increasing the number of stitches nearly as drastically as the pattern called for (which happens in accordance with the thumb, which I was needing to be a little tighter because with the top open, I would only be placing thrums near the bottom, as I did not relish the idea of creating some kind of thumb-sized sockyarn flap, hoo boy is this a long digression) um, so, laying off on the thrums and keeping about the same number of stitches as the cuff should, I hope, allow for blood circulation to my fingers. Which is right up there with being swathed in roving for keeping them warm. I hereby apologize for that paragraph. And I'm not even done yet. So ANYWAY, the too-large thrums at the bottom of the mitt, plus the nice, gentle pastel palate, kind of gives the impression that my entire hand is in a cast. About once a year, a freshman guy walks into his English classroom with a hand wrapped up in tape and maybe plaster, after having put his fist through some plate glass as the culmination of a fight or at least confrontation concerning either a woman or a guitar. Sometimes both. With these mitts, I will be rocking the "I got drunk and put my fist through a plate glass window at about 4am last night" look. Not any of this is to say that I'm not completely in love with these mittens. I love them. The one that's done is so freaking warm. And soft. And pretty, if medical-looking.